I’m hungover. I also had to go to the dentist this morning. These two states of being do not go. But at least I could console myself with a visit to my favourite fabric shop, B&M Fabric in Leeds Kirkgate Market. 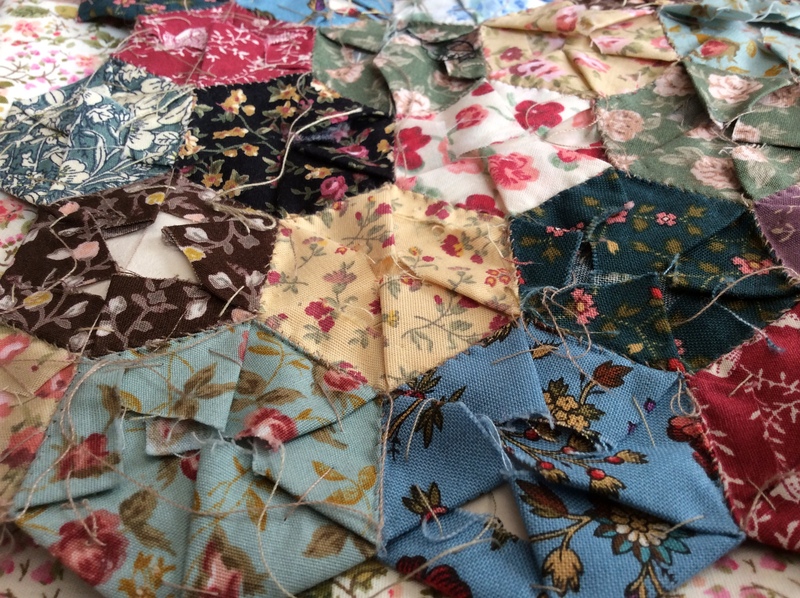 It also occurred to me as I sit here on my sofa gradually feeling the soft tissues of the right-hand side of my face returning, that this is a good opportunity to proffer a little bit of an explanation of how I do English paper piecing. I started the new tapestry yesterday, but hope you can forgive the delay caused by this little interlude. I painted my bedroom white the other week, and got white bedding and curtains. The plan is to spice it all up with a pretty dramatic patchwork bedspread. I have lusted after one for a long time, I loved them since seeing them in museums, like Beamish and the Black Country Museum. One of my prize possessions is an original Victorian iron bed, and there is nothing more appropriate for it. 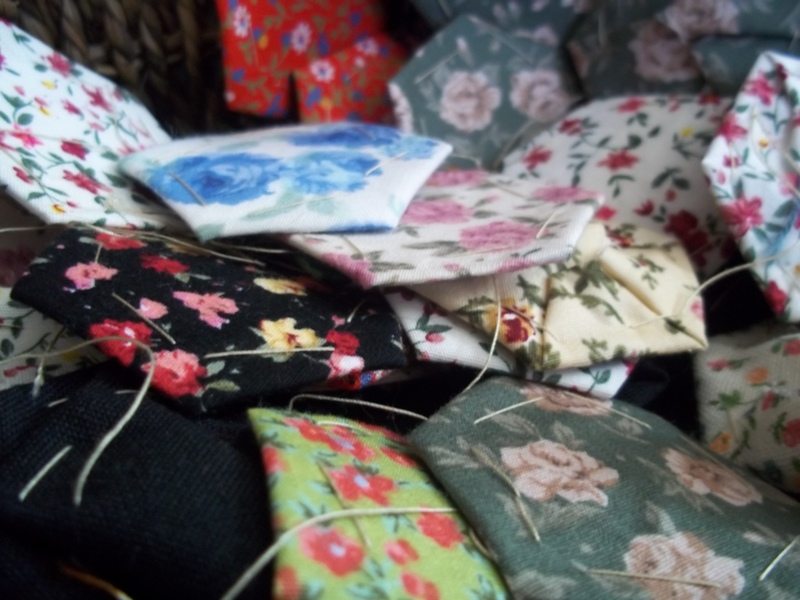 I’ve been doing it off-and-on for a goodly while, building up my little stash of hexies, and I’m about half way through. But now the bedroom is done, it is time to get this cover finished. I have a rather large fabric stash, but strangely found all of them totally unsuitable forcing me, very sadly, to buy lots more. 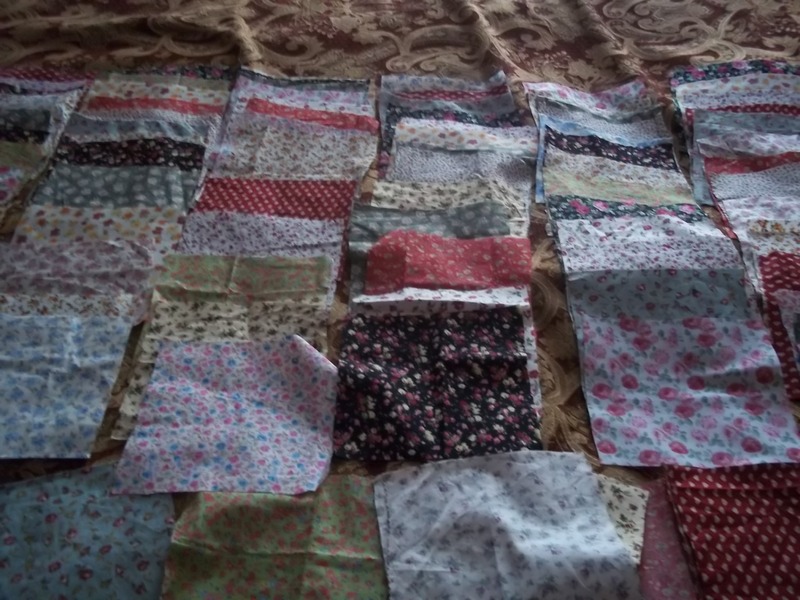 🙂 Personally I avoid fat quarters, I just buy half-yards of printed cotton; far, far cheaper. I made sure all my colours work together, I didn’t want anything that stood out too much from the crowd. Mine are all also quite muted. 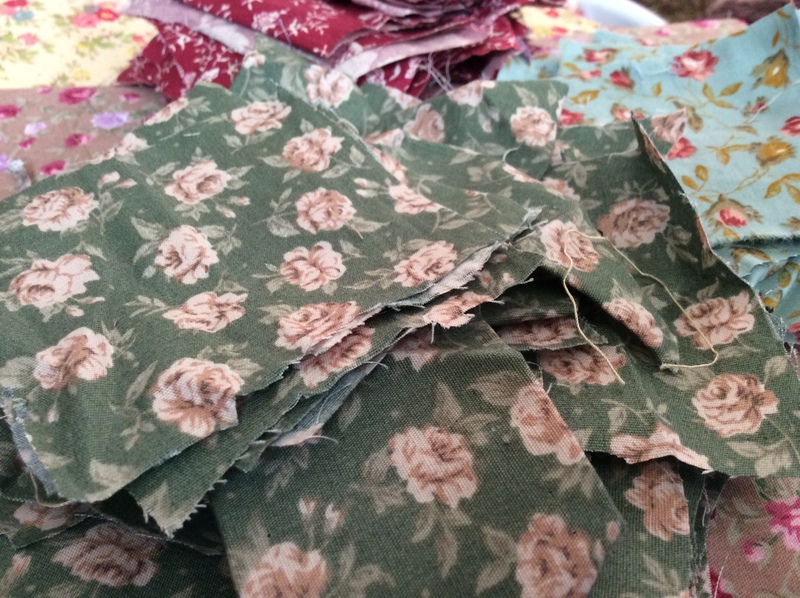 I decided to use all patterned cottons, but one could also add plain fabrics too. For my bedspread I have focused on small florals. I avoided any fabric that had too big a pattern on it, as it would just get lost once it was cut up. I used blank wallpaper for my templates as it is relatively cheap and also quite stiff. You can make or buy an original template, but I use a Fiskars squeeze punch – it is super fast and means all my templates are the same size.. I use their extra-large punch, it gives me hexies with an inch each side. I cut the fabric into squares, often the size will be dictated by the size of the fabric scraps, but I do like a good margin. 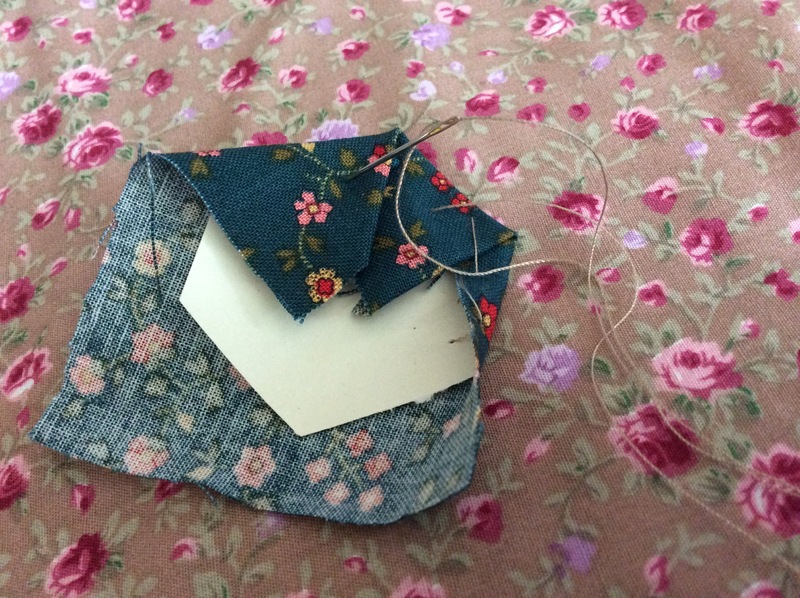 I place the template on the reverse side of the fabric and fold over an edge. With a wide stitch I secure the sides and corners through the fabric and paper, there is usually just the one stitch each side. You don’t want to knot at the beginning or the end as you will pull this thread out later on. You will soon find yourself making a goodly pile. And then you will have a basketful which you can just look at, and occasionally, you are allowed to stroke it. Also, you can mix them all up and put them back in order again. If that’s your thing. 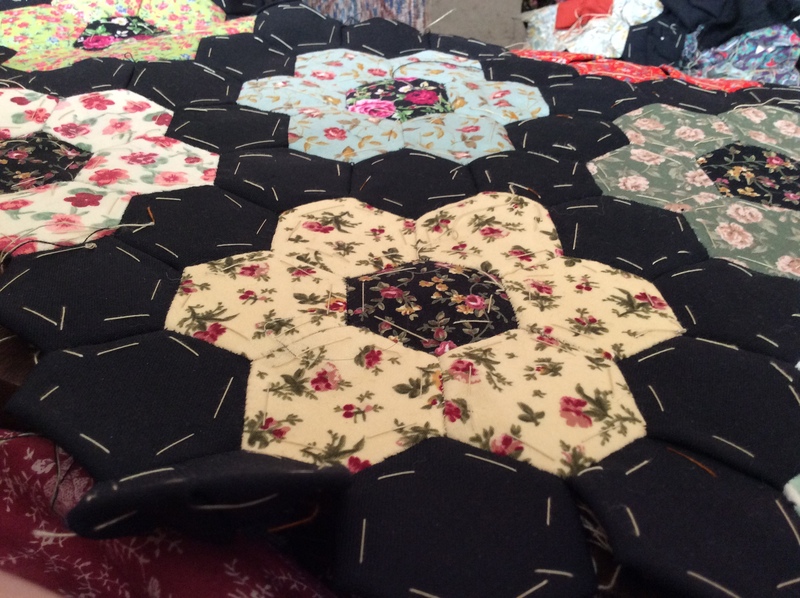 When I’m ready to join the hexies together, I put them right sides together. 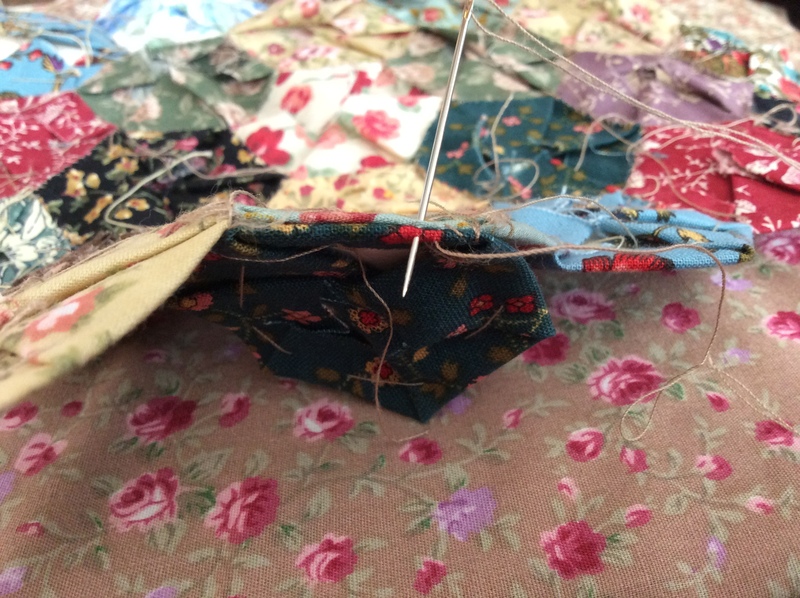 I whip stitch at the top edges., just catching the fabric, trying to avoid sewing into the paper if I can. Once a hexagon has been completely surrounded on all sides by another hexagon, I remove the paper template. 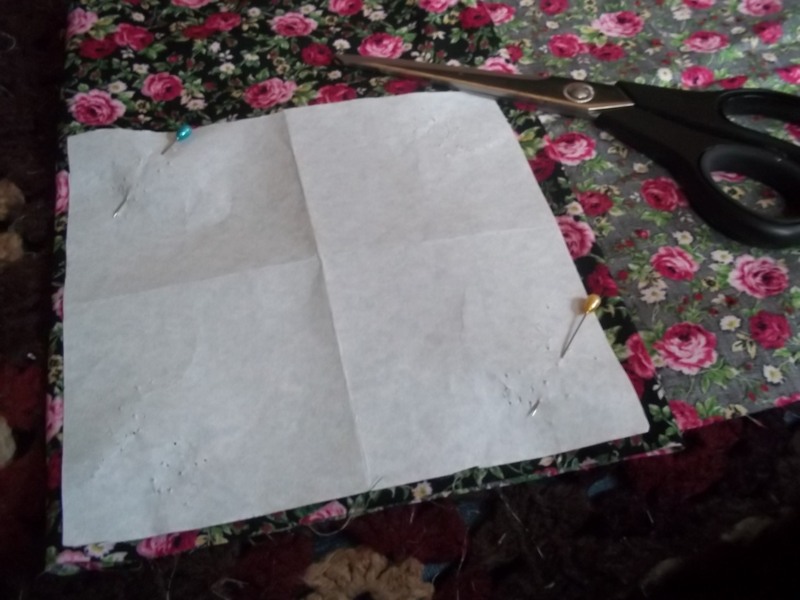 I simply snip or pull out the running stitch which frees up the oaoer which can now be eased out from the back. In the old days sometimes they kept them in for extra insulation. Once the paper is removed, the shape of the hexagon will stay in place. The paper hexagons can be reused. You may want to think how you want to put the hexies together. You can do them randomly like mine, although I say random, I do try to make sure hexies of the same fabric aren’t too close together. 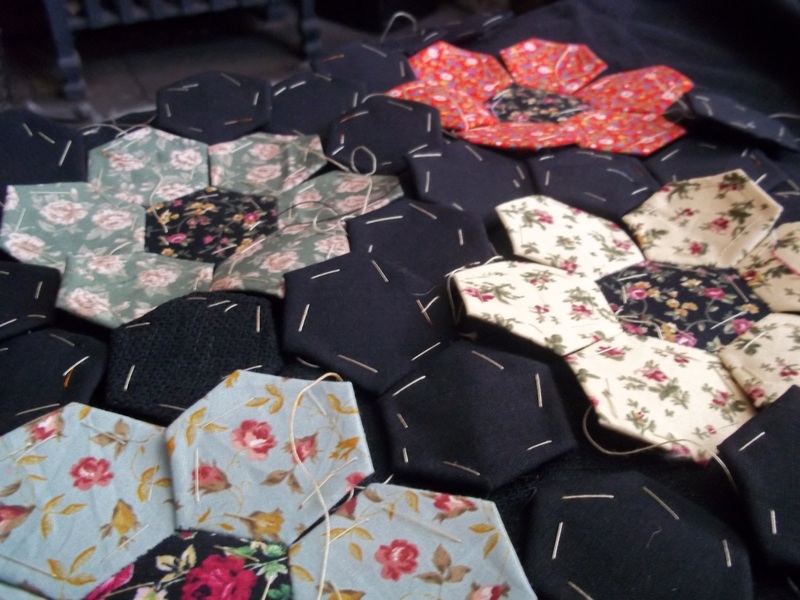 You can also make your hexies into little hexie flowers and join those together, or perhaps surround the hexie flowers with another colour. The possibilities are endless. 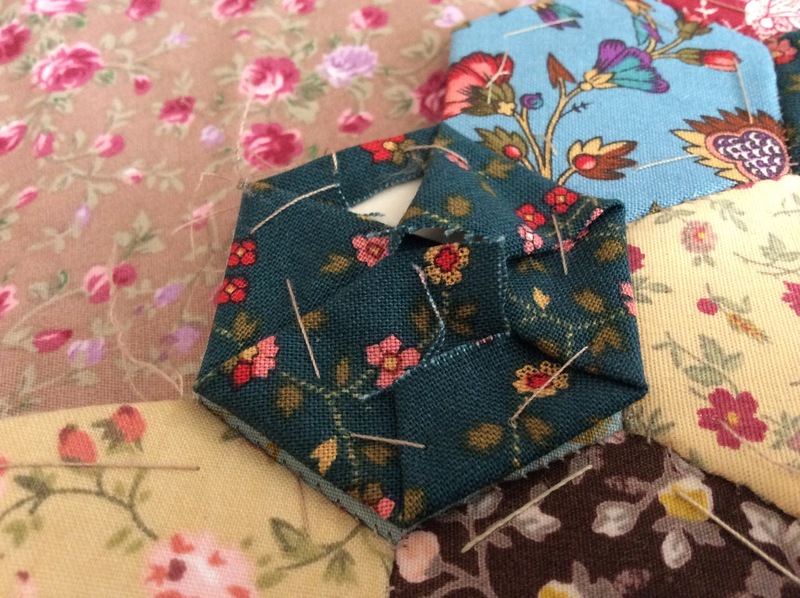 I have a Pinterest board with some of my favourite hexagon patchwork, but there are plenty of others too. This is one of the few things I do for fun, to relax, in my pjs, on the sofa, watching crap on the iPlayer. Hopefully I will have a lovely traditional quilt at the end of it. It is also very transportable for train journeys, I just pop cotton and needle, some templates and precut fabric into a tin or little plastic tub and stick it in my bag. I reckon I’m going to need about 2000 hexies to do my bedspread but my bed is really high off the ground though. Don’t let this put you off, you will be surprised how quickly it builds. Although I do often have to remind myself how to eat an elephant – one bite at a time. Weeks 11 & 12: Bunking off! 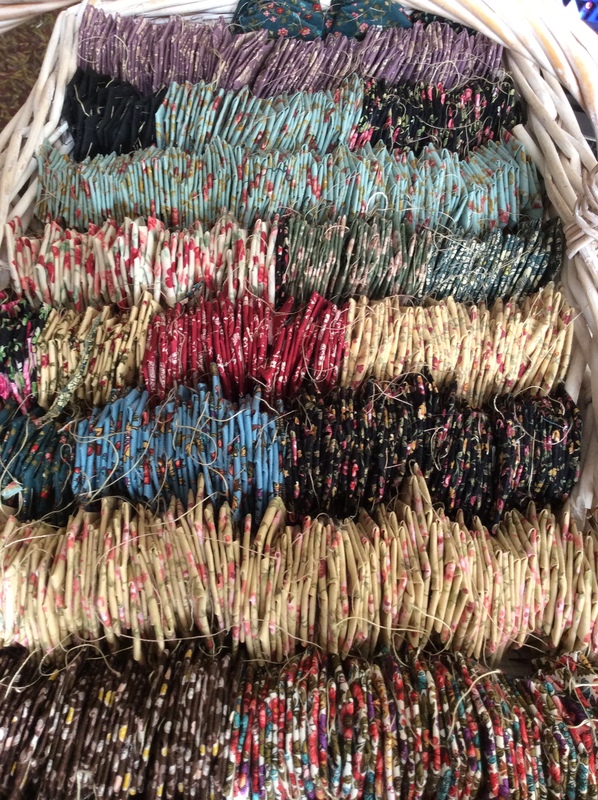 I had a very good week at the loom, good progress has been made – actually that’s a complete lie; I disliked the colour of some of the petals of the new plait, they were too similar so out they came. I’m really glad I did it, I think it had been nagging at me for a while, so it is progress of sorts. I got to the point where I really couldn’t go on without platforms. The chaps who are making them have just got their saw fixed and I was hopeful they might get done soon so it seemed a good point to have a few days off. Over the last few months I’ve been developing a lot of ideas for future projects and things I wanted to try out, but didn’t have the time or energy to do it once I got home of an evening, so it was a good chance to get organised and to experiment. 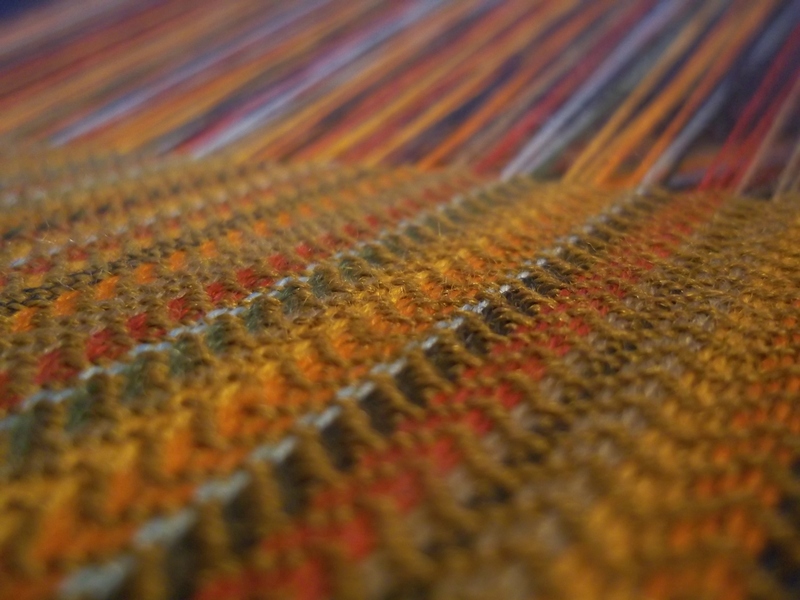 One goal was to try to weave a small tapestry, something that could be put in a frame. 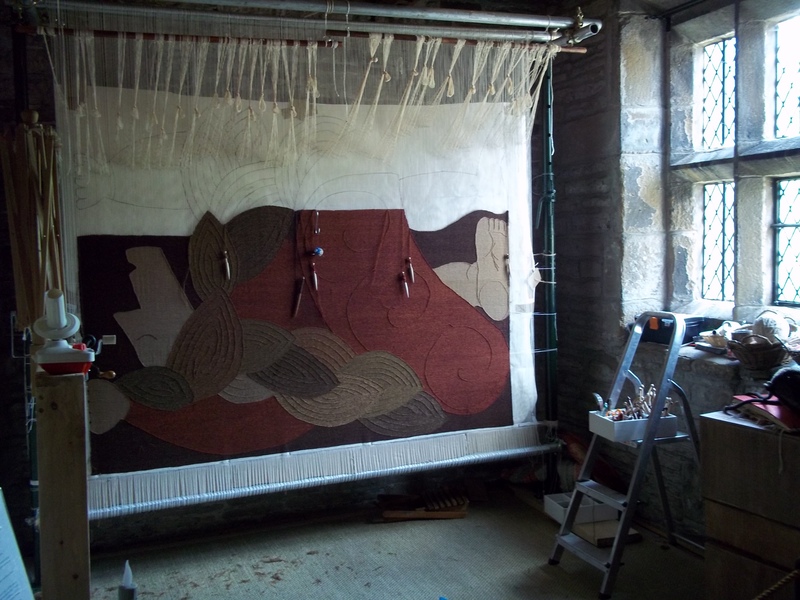 I was told recently I was unlikely to get accepted for a tapestry exhibition due to the size of my work. I did try, honestly I did, I even sourced and painted some frames. But it just wasn’t me. I think tapestries should be large, monumental even, I do struggle to see the point of some smaller works (there are notable exceptions to that, of course!). Besides, do I really want to change my work just to fit in to current ideas of what tapestry should be? Nah, not really. I am not a weaver of small things and am happy to stay that way. I did hear recently that a group is forming for folk who do weave larger tapestries and I am mighty glad to hear it. 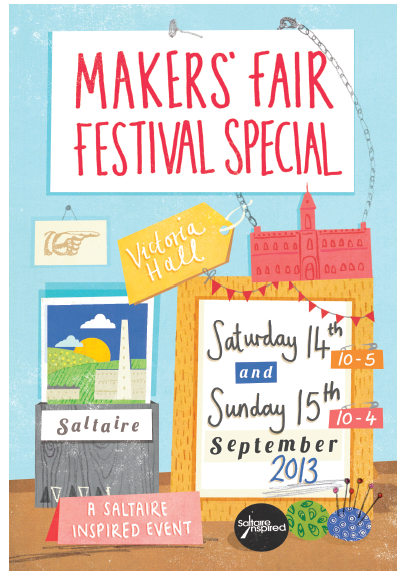 I also spent quite a bit of time fattening up ideas for a series of potential workshops next year. 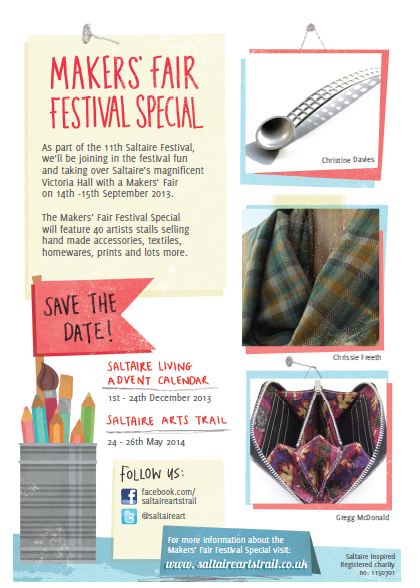 More details to follow but they will focus on traditional textile techniques; tapestry, weaving, rag rugs, patchwork, crochet and blackwork. Oh oh oh that reminds me, did I mention this fantastic gismo I came across – I found it on a Pinterest board and was so overwhelmed with excitement I forgot to note where I saw it. 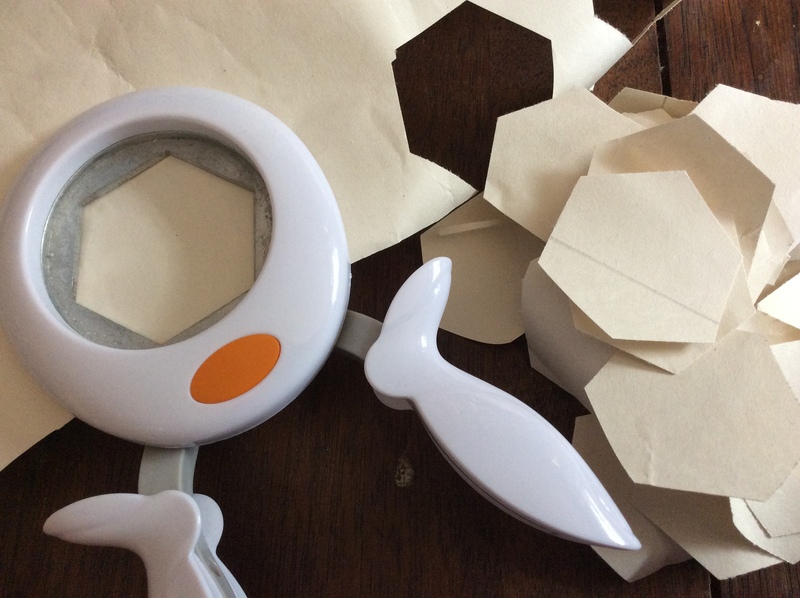 One of the most irritating things for me about patchwork is cutting out the flipping templates, well this is a Fiskars squeeze punch for card making but it makes templates in seconds – and no sloppy edges either, all consistent size. Revelatory! When I wasn’t putting hexagons into every piece of paper I could lay my hands on, I also cracked open my sketchbook and started work on some ideas for my next few projects. A lot of drawings had something of Maides Coign about them, in that they were quite abstract and blocky, and made use of more soumak. Perhaps that is my thing for now, which is fair enough and I am happy to go with it while I still feel it is worth exploring. While I was away I did miss East Riddlesden desperately and I was very glad to get back there this morning. Alas the platforms still haven’t been made so I was getting ready to be on my feet all day. I did have a visit from a colleague who I respect greatly and that made the morning pass very quickly. But then by lunchtime the skies greyed over and the heavens opened and gone was my light and I was effectively weaving in the dark. I went for a slap up lunch in the tea rooms hoping it would brighten up but it never did and I ended up coming home early; I knew if I carried on I would just end up making mistakes. The forecast is bad tomorrow too, so wish me luck. Oh the joys of working in a National Trust house! The light above the loom is an eighteenth century lantern, and quite frankly, rubbish. Got my wrists slapped last night for not updating my blog. Truth is I have been enjoying some pretty serious Chrissie time, mucking about in my workroom. I’ve been playing, sketching for the first time since school, printing, painting, exploring with my camera. I’ve been thinking about my Nan a lot too, the making and doing we used to do at her table, I guess I have been tapping into that freedom to explore and create we enjoy as children but shun as adults, doing things for their own sake, not worrying why you are doing it or how they will turn out. At the same time I put a small warp on my scaffold loom Evil Norris. The project I had planned of my great-grandmother will involve such a big time commitment I wanted to make sure I was doing the right thing. I did another sample area of the rose and wasn’t too happy with it – rather than a flower, I was merely reproducing the artefacts intrinsic to the blown up photograph; I realised I would have to start the design process again. “Creativity is allowing yourself to make mistakes. Art is knowing which ones to keep” Scott Adams. 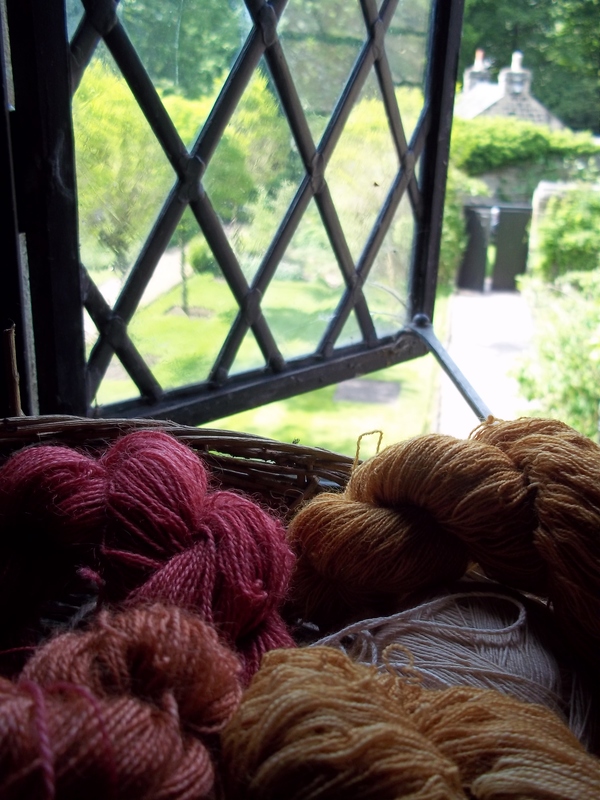 But one afternoon I spent printing, the images I made were quick and spontaneous, they were also quite dark and atmospheric – all aspects at odds with the methodical, slow going, warmth traditionally associated with tapestry weaving and I liked that contrast. I also saw a mythological element in the images and felt that link to the past which as an archaeologist I crave. The images just seemed darker and deeper and a bit more ‘me’. One in particular I started to like, it reminded me of a tree and with its nine branches it brought to mind the Yggdrasil from Norse mythology and I made some samples on the loom that seemed to look ok. Initially I thought if I was going to try to weave it I would be sensible and do it on a smaller scale, but it didn’t seem right, these images are landscapes and I want to weave a ‘gateway’ into them, plugging into that link between weaving and myths, and for that the tapestry needed to be large and I’ve made a cartoon a couple of metres long. It will be woven on the side so that will be the finished height. I haven’t seen tapestry like this before, and of course there may be a good reason for that and it might not work – will the atmosphere of the print translate into a tapestry? Nevertheless I have decided to give it a go – if it works it could be brilliant, and perhaps I have found a voice intrinsic to me as a weaver, and if it doesn’t well so be it – it will be a lesson learned and the skills I develop can be used for the next project. It doesn’t mean that I won’t be doing my great-grandmother project at some point, but it will be on the back burners for a while. And I’ve also have an order to fill for the lovely Imaginarium Gallery in Haworth, and have been weaving some of my ‘Rainbow Twill’ for that, working hard to clear the decks as much a I can and plan to put the warp for the tapestry onto Evil Norris tomorrow. 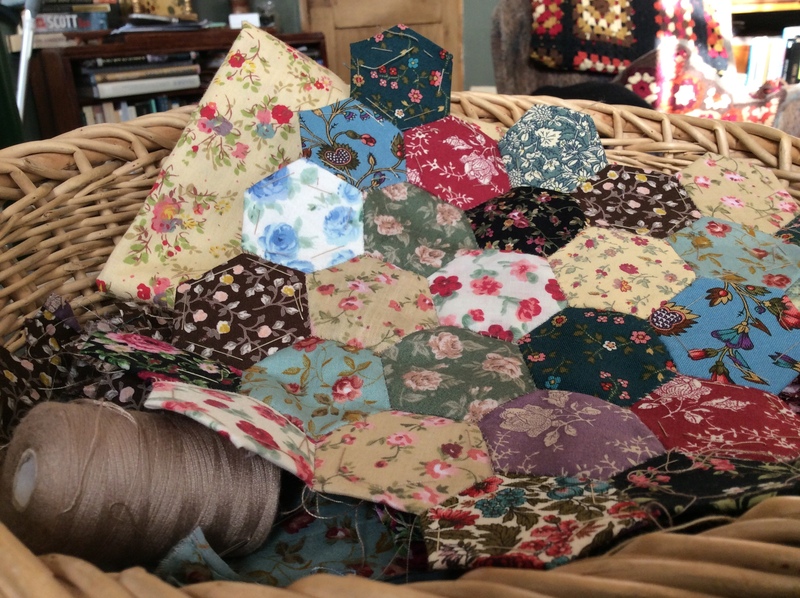 Today – I am sorry to confess – I am nursing a hangover but it is a good excuse to add to my stash of patchwork hexagons – they are a great way to relax away from the looms, very addictive and easy to do but which will one day hopefully end up as a bed spread of black-framed flowers. For some reason I thought it was really difficult until someone showed me how to do it a month or so back. I am sorry to say I was eyeing up a perfectly good dress of mine though wanting to use the fabric. 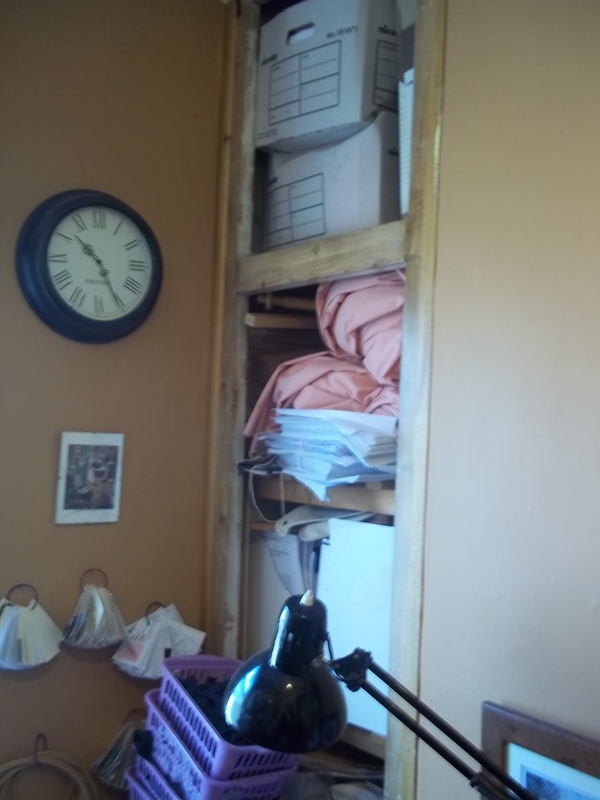 In my workroom is a recess that stretches over the stairs; since I moved in a plain white curtain covered all the junk I hid there – but no more! 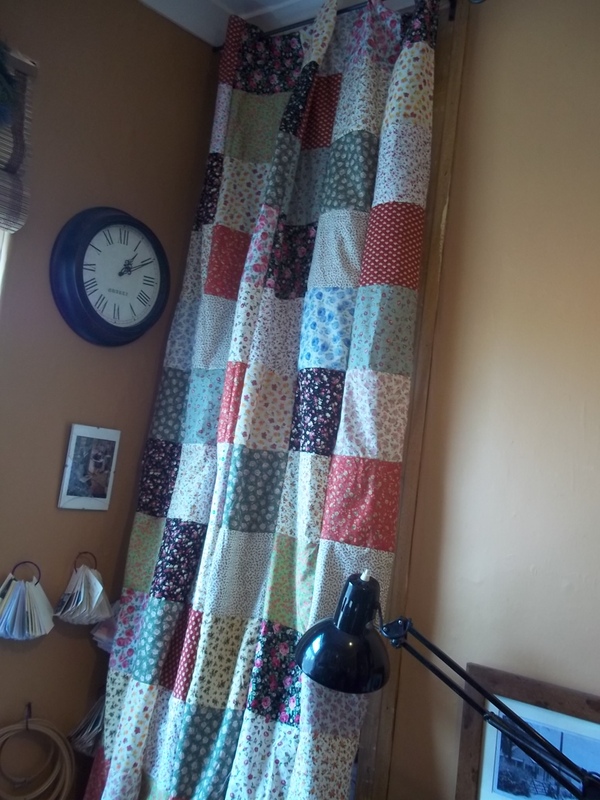 Long inspired by the Vintage Vixen’s patchwork curtains, I have finally got round to making my own and thought I would share how I did it. I measured the original curtain to determine height and width. I had decided on seven-inch squares as a neither too big or too small, and just divided the curtain measurement by 7 to work out how many squares I needed. In the end it was 6 columns of 15 rows. I made a seven-inch template and cut out the squares, folding the fabric to cut as many at the same time as I could. I did not add a seam allowance, I was not too fussed about them being 7 inches dead on, all that mattered was they were the same size. I then laid them out making sure there were no great clashes of colour and pattern. 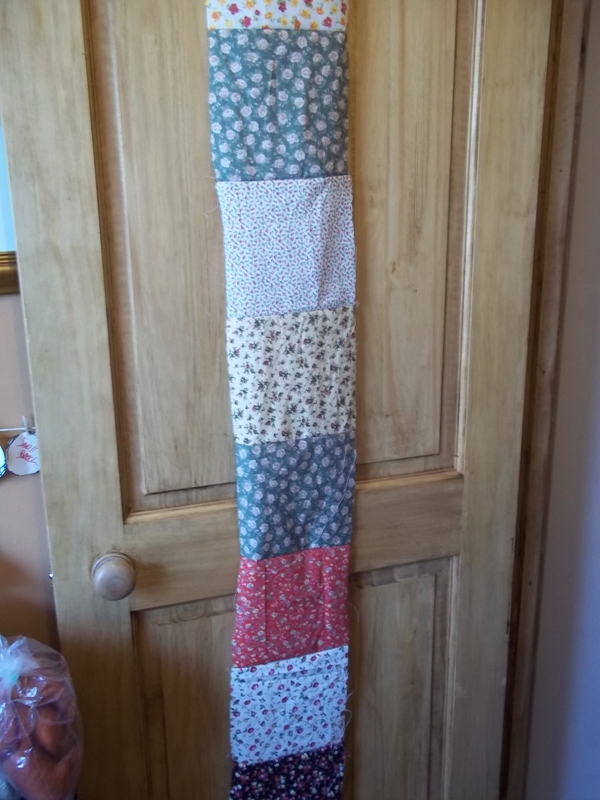 I then sewed up the fifteen squares to make a column, and then I sewed the columns together. A simple bit of hemming all round, and the hammering of half a dozen eyelets at the top and voila! 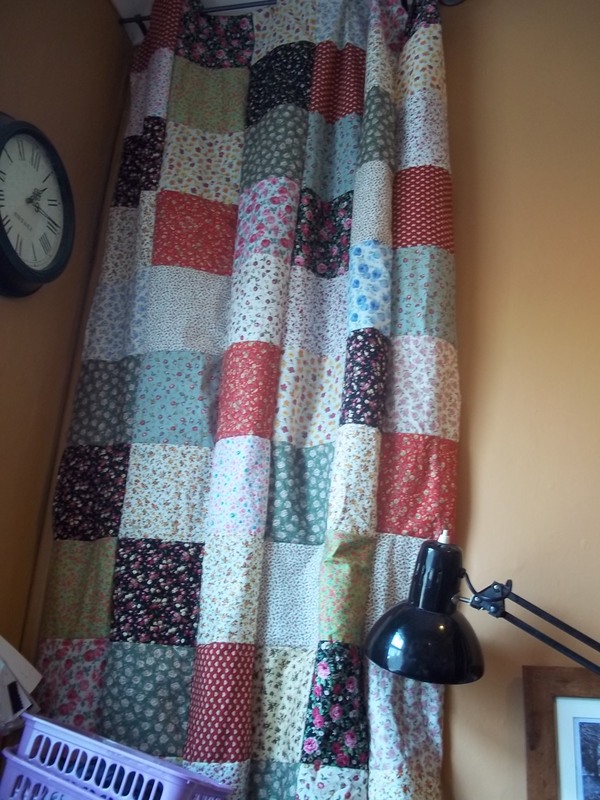 My workroom is very small so it is hard to get a decent picture and annoyingly the lower half will be obscured by a bookcase, but if my entire house isn’t covered in patchwork by the end of the summer I will be astounded. I love it. And nothing says homely and traditional more, and it was far less scary to do than I thought it would be. It took an evening to do the cutting and according to the clocks in the pictures, just a few hours to make up! 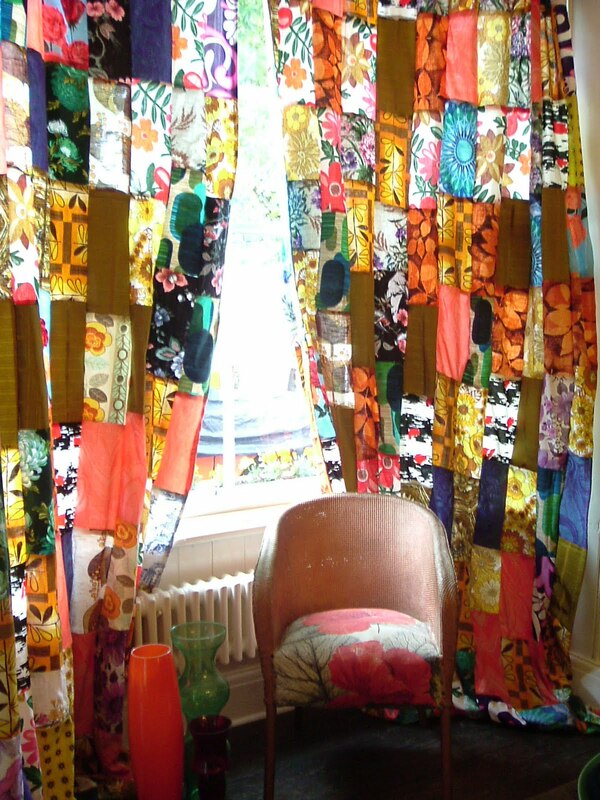 May 2012 – finally got round to making my own patchwork curtains, read how here. 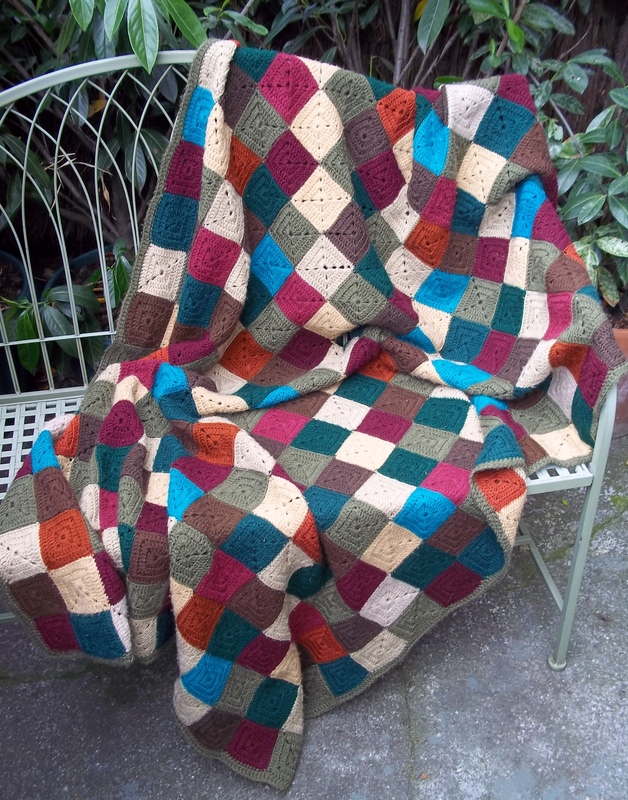 This blanket is based on the project in “201 Crochet Motifs, Blocks, Patterns and Ideas”. 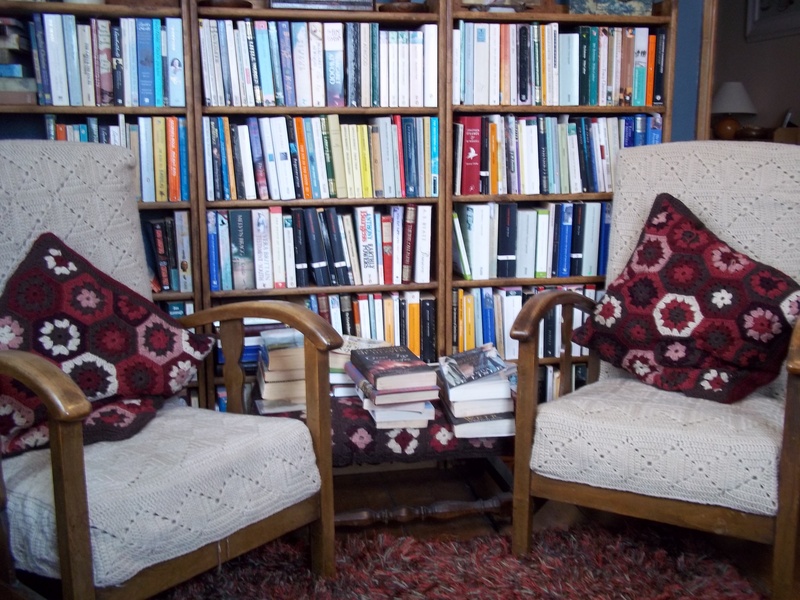 I used the same square pattern to make a covering for these armchairs in my study. The simple square motif repeated in a single colour also adds a diamond pattern. The cushions and covering for the stool are granny hexagons and granny squares respectively.